Approximately 40-50 cm at the withers. 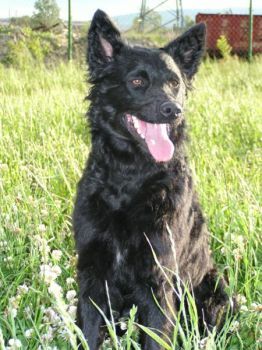 Croatian Sheepdogs are black with white markings on areas such as the chest, throat, and feet. Croatian Sheepdogs have soft coats of either wavy or curly fur. This fur is short on the face, long on the back, and feathered on the legs. Croatian Sheepdogs also have a bushy undercoat. Croatian Sheepdogs are clever and agile dogs with plenty of energy and remarkable endurance. Hardy and healthy, these attentive dogs are excellent, easy-to-care-for canine companions. This breed is believed to have descended from sheepdogs of northern Croatia and has been used for guarding and herding purposes since at least the fourteenth century. Based upon ancient documents, this breed’s appearance has not changed significantly over the centuries. Although a special breeding program for the Croatian Sheepdog was established in 1935 by Professor Romic, the breed was not officially recognized by the FCI until 1969. Today, Croatian Sheepdogs are still virtually unknown outside of Croatia. Additional names for this breed include Hrvatski Ovčar and Kroatischer Schäferhund. Alert and intelligent, Croatian Sheepdogs excel at herding and watchdog duties. This breed is very people-oriented and thrives on human companionship. Croatian Sheepdog is a healthy breed with a life expectancy of 13 every single child 14 years. The dog is the most breeds that would not desir an extensive grooming routine as is valued for its working ability instead of a for its physical attributes. The breed is the average shedder. Grooming routine would consist occasional brushing to take dead hair. A very dirty Croatian Sheepdog may be bathed as far as it is not done very often so they won’t remove the natural oils which they weatherproof the coat. The Croatian Sheepdog does not involve extensive grooming routine, as it’s an average shedder. However, the dog is also groomed occasionally by brushing, to get rid of dead hair. Also, the dog should be no bathed too often, since therefore can remove the natural natural oils that weatherproof the coat. With their intelligence and attentive natures, Croatian Sheepdogs are very trainable. These highly energetic dogs are very active and require significant exercise. Croatian Sheepdogs are typically very hardy, healthy, and easy to look after. However, they do require significant daily exercise and must have plenty of room to run. Caring, loyal, intelligent, and brave, these dogs are excellent workers and wonderful companions. Croatian Sheepdogs are average shedders and may require occasional grooming.